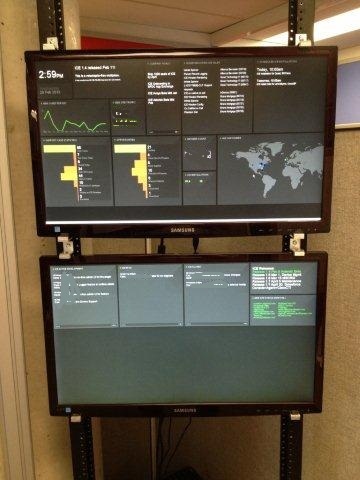 Our company uses Geckoboard.com to display the status of a ton of Salesforce.com related information, as well as info we pull from Trello.com, Fogbugz.com, and BinaryCanary.com. BinaryCanary.com is a website monitoring company that allows us to monitor all our online properties, and alerts us if there are any issues. BinaryCanary.com has an API that we can query to determine the status of each of our monitors. We wrote a small PHP script which is polled by Geckoboard.com every 3 minutes, and checks the status of all our online properties. The returns a simple XML file, which is then displayed by Geckoboard.com in a text window. We are able to use simple HTML like <table> and <font> to make the text display green for sites that are up, and red for any sites that are down. Here’s the PHP file we use to generate the XML for this widget. At InGenius we typically have quite a few projects on the go, and a lot of very busy developers. our sales people know when new builds, with new features are coming out. And, none of it worked very well. Developers don’t like meetings, don’t like yammering, don’t like anything that gets in the way of what they should be focused on. Last fall, we started using Trello.com, a new FREE online product from Fog Creek Software – the same people that build the terrific Fogbugz bug tracking system we use here at InGenius. We’re all thrilled with the results! Trello is a deceptively simple application. It presents you with a page called a “board”, and the board contains multiple lists. Each list can have a title, and multiple entries, known as cards. You can learn how to build a website, and you can re-order lists by dragging them as well. Cards are the basic unit within Trello. Cards generally move up and down in a list, and from list to list, within a board. Each card has a title, and when you click on it, it flips over to reveal a description, and a set of notes. 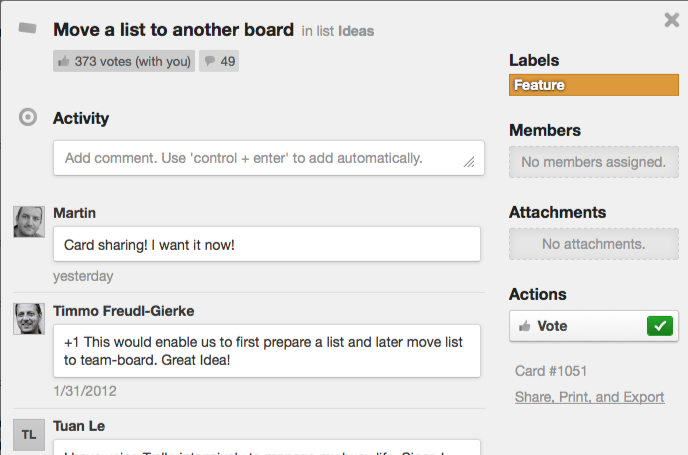 People can add comments to a card, assign labels, assign a card to a particular worker, or vote on a card. a list for each release. Items generally move across, from left to right as they progress from ideas, to being implemented, to getting moved to a release. Using Trello has been a godsend for both the developers and senior staff at InGenius. We can now easily see, in a single view, everything that’s in progress in the company, and can easily move cards around to indicate their priority. Developers can easily make notes about their progress, which we review in a once-a-week meeting to make sure everyone’s on track. Each card contains a description of the bug or feature. Developers can easily add notes about their progress, and can move a card to the “Implemented” list when they’re done. And, our QA staff can easily look at the lists for each release, to see which new features have been implemented, so they know where to focus their testing efforts. Trello has become the focus of our developer meetings, allowing us to keep the meeting to 15-20 minutes and make sure everyone is on the right track. Don’t overload Trello with too many items. In our case, we keep the “high level” items in Trello, and leave most of the detail work in FogBugz. The items we track in Trello are generally the things that we’ll highlight in each product release, and major, customer-affecting issues. The balance between Trello and your bug tracking tool is hard to determine. Encourage higher management and sales to use Trello too. Have a look at Trello’s development board for ideas and tips – and it’s fun to watch features move across, and out into a release! Of course, Trello is not yet perfect, but new features are being implemented every week. Integrated CRM and telephony programs can be intimidating for the uninitiated. Programs are often full of acronyms and may feel overly technical. The customizable options are exciting for seasoned professionals, but potentially overwhelming to first time users. So what does someone fresh to the field really need to know about CRMs and telephony to get started and to make the programs work well for their business? These help document, monitor, and track a company’s interactions, primarily with its customers. The most popular CRMs right now seem to be the web-based programs. There are lots of great CRM programs out there, and we’ll get to those in a later post. A word for a phone system or a bunch of phones networked together. If your office has a phone system with extensions, or if you need to do something like “press 9 for an outside line” then you something about telephony. This means speaking through the internet rather than through phone lines. The most well known VoIP provider is probably Skype, which allows users to download it’s software for free, make calls between web-based Skype users for free, and make calls from web-based Skype users to landlines for reduced prices. This is a standard internet language for calling via voice and video. I don’t really think it is important for the lay person to understand. It might be important to know whether you are connected to a SIP based service provider. Internet language – or – how information is sent and received over the internet. You may need to know something called your IP Address, which is a string of numbers separated by dots. This is the location of your machine on the internet, just like your home address is the location of your house in the world. This is a kind of phone line. The ability of the phone to signal that another call is trying to access your line while you are on a call. A call involving more than two parties. Ha! No really, this is a thing. Actually, it’s the same thing as above, except maybe the ‘pop’ isn’t the whole screen but rather a smaller window that appears from another application. Like toast. Coming out of a toaster. Get it? Why don’t we just call this ‘Caller ID,’ which everyone understands? I don’t know. Caller ID means that you can see who is ringing your phone before picking up. These are records of inbound and outbound calls, or, all of the calls made from your phone. InGenius Connector Plugins will help your CRM log calls and attach records or notes to those calls. This is helpful for remembering each step of the sale or interaction and making sure that tasks do not fall through the cracks. When a program is based in the ‘cloud’ it means that there is nothing stored on your hard drive or local server. People appreciate that they do not need to download or install anything onto their computers, and that their data can be accessed from anywhere. Salesforce is known for being a cloud based CRM. Things are evolving fast and different stuff is appearing all the time. Are there any other terms that you think are important for beginners? Are there other important features that you use currently, or would like to see in the future? It has been a few months since we first mentioned Mitel’s Live Content Suite application, and we are thrilled that the product has finally been released for Mitel 5360 IP phones. Developed by the InGenius Telephony Software team, this application is truly innovative and forward thinking in the way it embraces personalization and leverages live content. This is just one of the many “Unified Communications 2.0” applications to come out InGenius and users can expect to see more in the very near future! Live Content Suite is expected to become available for other Mitel display phone models (5320, 5330, and 5340) in the coming months. Check out www.livecontentsuite.com to learn more! After just releasing InGenius Connector for General Availability on Asterisk Exchange and unpacking from ITExpo, the InGenius team is packing their bags again to head West to attend the TEAM Polycom event next week in San Diego, CA. Located in the Applications Beyond Voice Pavilion, booth 504, InGenius will be revealing the InGenius Application Server for Spectralink Wireless Handsets. This incredibly cool application server offers something for both Spectralink users and Spectralink Application developers. It is shipped with a set-to-set texting application and a corporate directory look-up application, and also has the ability to run multiple applications simultaneously. As an added bonus, InGenius Application Server houses a framework that can be extended to develop or customize applications using commonly available Microsoft .Net development tools. Whether you are looking to increase company communication and productivity or trying to extend the value of your Spectralink 8020/8030 Wireless telephone offering, InGenius Application Server offers a quality solution that fits current and future business needs. If you are attending TEAM Polycom we would love to give you a demo, stop by booth 504 and say hello! InGenius is very happy to be attending ITExpo East in Miami on January 20-23 as members of the Ontario pavilion in Booth 512. We are going to be showing InGenius Connector and all the cool things that it can do to help accelerate and simplify phone communications for those with a Polycom phone, Asterisk switch, BroadSoft Network or Mitel switch. InGenius Connector has been in beta for the past few months and we are receiving a tremendous response from Polycom sales representatives, Asterisk solution providers, ITSPs and basic end-users about the value and benefits it supplies to them and their customers. Over and over we hear how much people love InGenius Connector and how well it integrates with their Outlook contacts, and Active Directory or LDAP directory. Users just can’t get over the cool Google search functions and how easy the application is to install and use. Once a person starts using InGenius Connector, they really wonder how the ever got along with out it. If you plan on attending ITExpo East please stop by booth 512 and we will be happy to give you a demo of InGenius Connector. We are at BroadSoft Connections 2009 and we are very happy to introduce InGenius Connector as a fully supported application for the BroadSoft Network. Combine the power of the Microsoft®, the power of Google®, and the power of Broadsoft to accelerate and simplify all your phone communications with InGenius Connector. 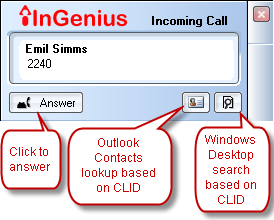 InGenius Connector is a PC application that provides click-to-dial capabilities and incoming caller ID screen pop, with full BroadSoft Directory, Microsoft® Outlook® and Active Directory® or LDAP Directory integration. And, InGenius Connector provides integrated web searches with GoogleMaps® and GoogleSearch® to locate and dial new contacts with just a single click. Integrated optional softphone, same great UI! If you are at BroadSoft Connections we would be happy to give you a demo. Stop by booth 41 and talk with our CEO Dale Gantous, or our CTO Rich Loen. Click here to see a video of InGenius Connector in action!